Thank you for registering for the MarTech NYC Meetup event. You will receive an email shortly with details. Would love to know why you joined the group, what you are looking to get out of it, and what events/speakers you would like to see. There’s a space below for your comments. In the mean time, feel free to check our MarTech Wiz, our sister site. 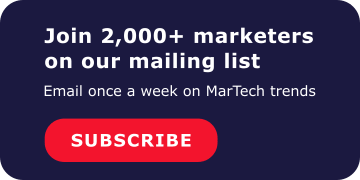 MarTech Wiz creates in-depth and honest product reviews on marketing technology that you can access free.